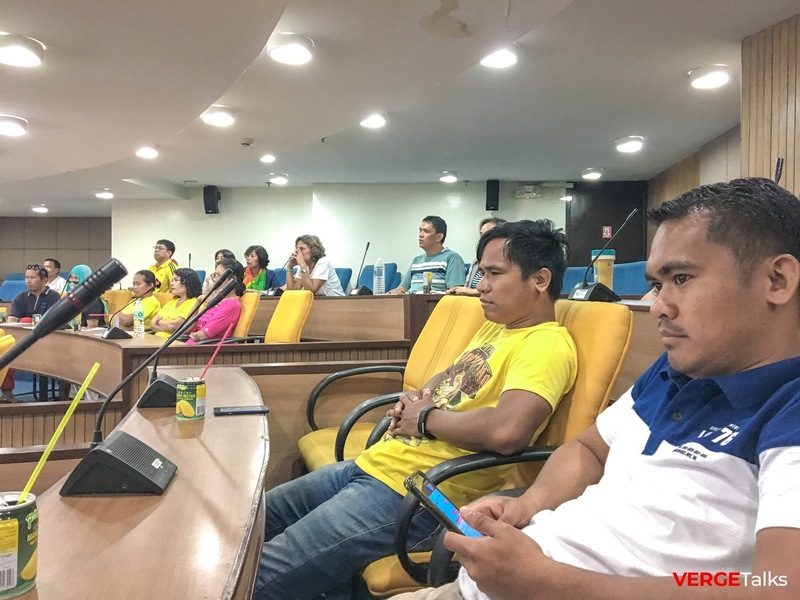 April 7, 2018 - RAFI Plenary Hall. Yesterday was another day of learning focused on weight management. 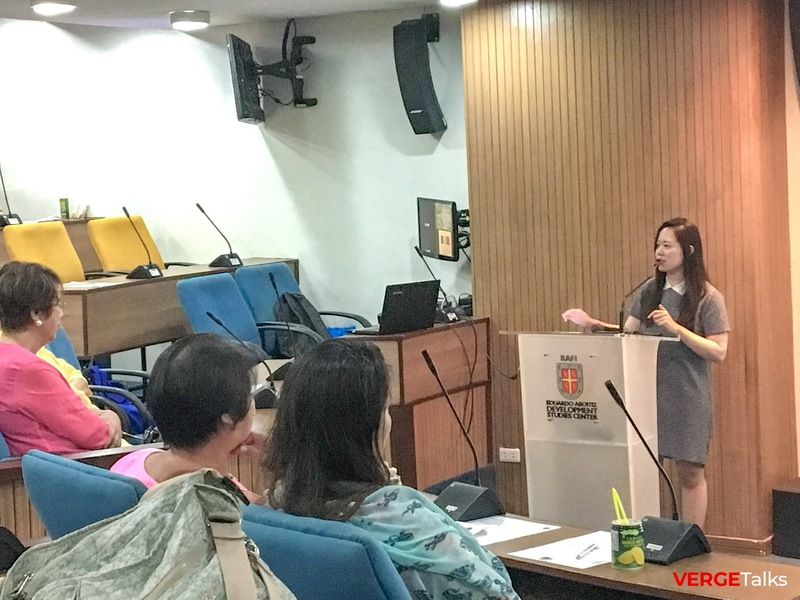 Dr Kyrene Gail Tiu-Ong of DietWise Nutrition Consultancy facilitated the great learning experience attended by people living with cancer within Cebu. 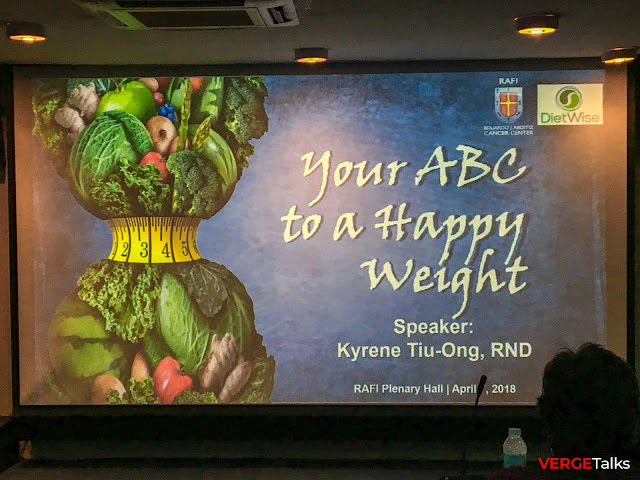 From the previous seminar on Basic Nutrition for newly-diagnosed cancer patients and patients undergoing treatment, weight management plays a key indicator on cancer treatment. It is important not just for cancer patienst but for everyone to be mindful about our weight and how to manage it. 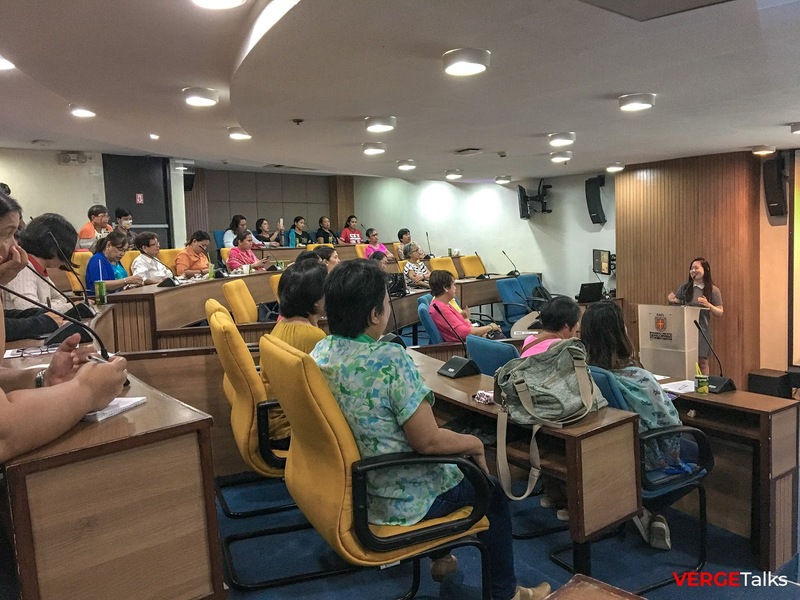 The event has been organized by Ramon Aboitiz Foundation Inc.- Eduardo J. Aboitiz Cancer Center (RAFI EJACC) Team headed by Ms Karen Wenceslao together with Sir Ronald Reyes to address myths on weight management, give hacks and promote holistic approach towards eating healthily. "If you are happy with your weight, stay at that weight"
Your ABC to a Happy Weight is summarized with the first three letters of the alphabet. Knowing that you are hitting the red bar on the weighing scale is not fun at all. Understanding what made you gain or loss weight paves the way to deeper thought and action items to either decrease, maintain or to increase mass. So why do we gain unnecessary weight? Simple. We eat to much than what our body actually need. 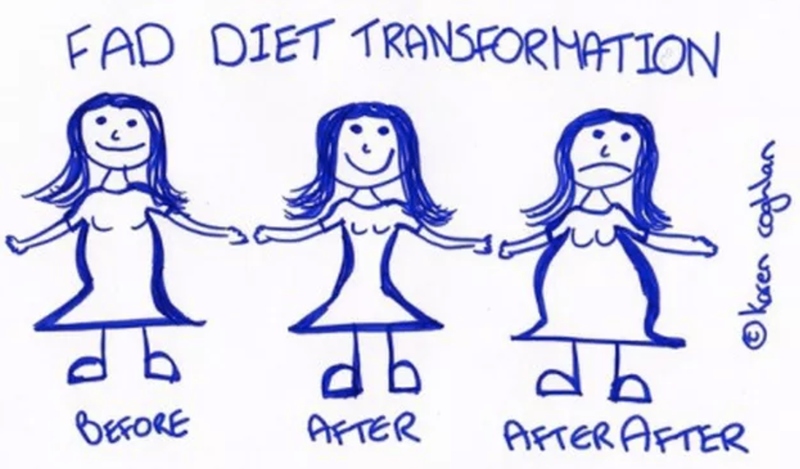 A fad diet is a diet that promises quick weight loss through what is usually an unhealthy and unbalanced diet. In the advent of social media, everyone is claiming a specific diet does work for them, however, one specific diet does not fit all. You may be a worshipper of Ketogenic Diet or Intermittent Fasting but you need to take consideration that you need to consult a nutritionist first to know the essentials of this type of approaches and not just for the sake of being "IN" and "COOL". There's a vast approaches to enlist yourself with, from Dr Atkin's Revo, The Cabbage Soup Diet, The Fat Flush Plan, The South Beach Diet, The Protein Power, The Zone Dietary Roadmap... hundreds of them, name them. 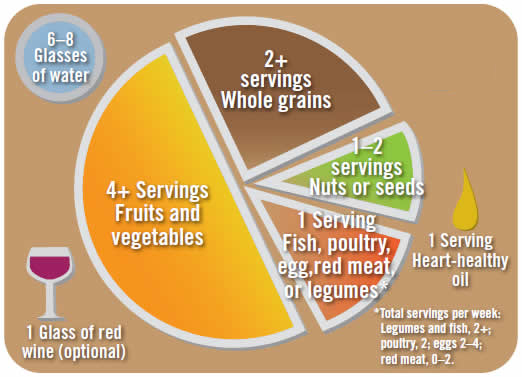 It is better to seek professional advise to pin point personal approach on dietary requirement best fit for you. DietWise Nutrition Consultancy can help with your goals. Drink 6-8 Glasses of water daily and don't wait to be thirsty as this is already indicator that your body has been dehydrated. Are you getting all the nutrients your body needs? Ask yourself. Does micronutrient deficiency cause obesity? Read through to learn more. Gym membership is pretty expensive but you don't need to go to the gym to exercise. Integrate motor skills in your daily lifestyle like using a pail to take a bath instead to just turning on your shower - this helps you exercise bending and using your thighs. Stress is all in your mind and is self inflicted - you need to learn to manage it. Do something that you enjoy doing and veer away from negativism. Focus on which food you should be eating and not the other way around. Gear on eating a Whole Foods Plant Based. Check the nutritional facts label, no label the better - the fresh tomato at your local supermarket doesn't have it right? Compared to the peeled tomato in can? No food labels or if has, check if contains enriched, bleached, refined flour, or simple sugars and HFGCS (High Fructose Corn Syrup) as one of the first 5 ingredients. Oils are sensitive to light and temperature, buy oils that are stored in tin cans and dark containers. Hack 5: Eat slower and mindfully! This is how your plate should look like! COLD WATER FACT. German researchers found that drinking six cups of cold water a day (that's 48 oz.) can raise resting metabolism by about 50 calories daily—enough to shed five pounds in a year. The increase may come from the work it takes to heat the water to body temperature. Have a light snack (Carbo-Protein) 30-45 minutes before and after your workout. Do HIIT Workout. HIIT is a training technique which involves intense bursts of high-intensity exercise followed by varied periods of low-intensity active rest, or complete rest. HIIT can be a great option for staying in shape when time is an issue, as you can get an amazing fat-burning workout in 20 minutes or less. You are what you eat and what you think! Your choice matters, whether you want to go on a full 100% WFPB Whole Food Plant Based lifestyle or not, it's really up to YOU! Eat a lot of plant foods and your body will do the math for you! Eat to live so you can live to eat! Happy Weight = weight at which you CAN do the things that really makes you HAPPY! 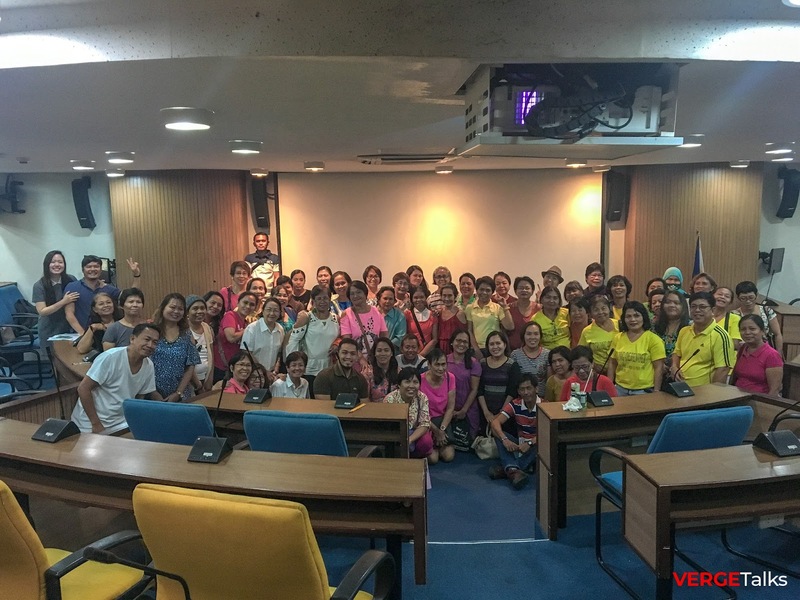 People living with Cancer with the resource speaker and organizers. The key to achieving and maintaining a healthy weight isn't about short-term dietary changes. It's about a lifestyle that includes healthy eating, regular physical activity and positive mindset.